A new drone, or what the company calls an unmanned aerial vehicle, is set to take flight Friday on Maryland's Eastern Shore. It's called the Talon 240, and residents near the airport in Crisfield may be able to see it in the air. The Talon 240 is a result of a partnership between the University of Maryland and a small business. “For us as a small company, to be able to participate in something like this with the University of Maryland is a very exciting experience,” said Bill Davidson, CEO of UAV Solutions. 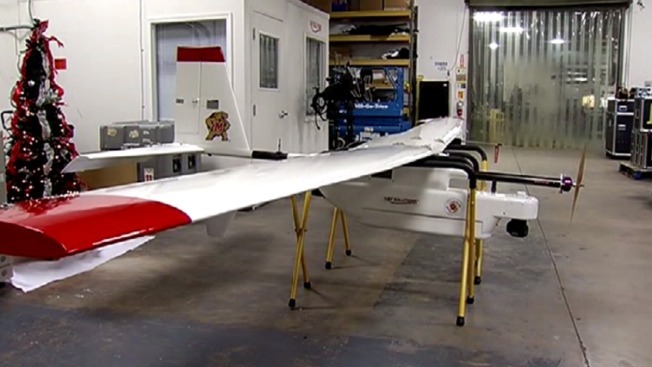 News4's Darcy Spencer got the first look at a new drone that's set to take flight Friday on Maryland's Eastern Shore. UAV Solutions built the Talon 240 for the University of Maryland as part of the Mid-Atlantic Aviation Partnership, or MAAP. The MAAP is one of six FAA designated test sites for the drone project. “It represents the university’s strong play in technology research over the years, but it also is capitalizing on Maryland’s technology corridor that we have in Southern Maryland,” said UMD UAV test site operation director Tony Pucciarella. The drone has been more than a year in the making, and the team is excited to launch it. “We’ll put the vehicle on top of a pickup truck, get it to launch speed, which is about 40 mph, and it will be released off of the pickup,” said Davidson. The Talon is expected to make about 10 flights a month. It’s equipped with a camera on the front but has room for ten pounds of equipment, such as sensors and more cameras that will be used for research. “Aquaculture, agriculture, utilities, emergency services, public safety – there’s a lot of companies that want to be involved in that market space,” said Pucciarella. The operator will use a ground control station to navigate the drone up to a few thousand feet in the air. They say it was built with safety in mind. The team has reached out to the community to let residents know the Talon 240 will be in flight.